Caroline Wozniacki, Petra Martic and Monica Puig also advance to last four of Volvo Car Open. No. 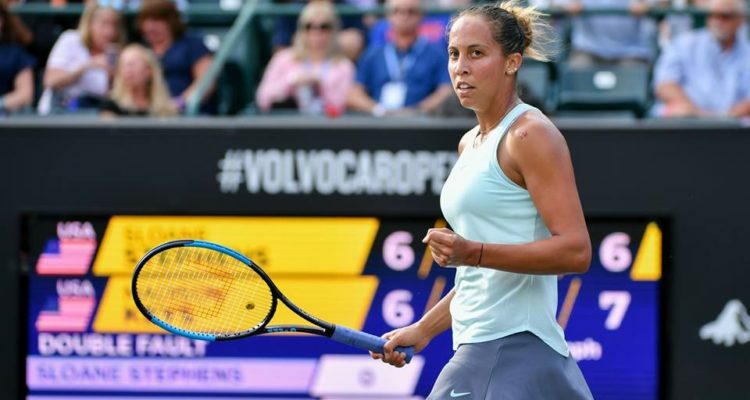 8 seed Madison Keys has strung together some nice wins this week at the WTA Volvo Car Open in Charleston, South Carolina, on green clay. However, none have been bigger than knocking off the top-seeded and World No. 8 Sloane Stephens, which the 18th-ranked Keys did on Friday night. In a tightly-contested quarterfinal battle among close friends, the two Americans put on quite a show at the Family Circle Tennis Center, won by Keys, 7-6 (6), 4-6, 6-2, in two hours and 12 minutes.
.@Madison_Keys earns her first win over Stephens, 7-6(6), 4-6, 6-2! Keys was 0-3 lifetime coming in against Stephens, including losses in the 2017 U.S. Open final and last year in the semifinals of Roland Garros. Thus, it was a breakthrough win for Keys. Of her seven wins this season on tour, Stephens was the highest-ranked player she had beaten this year. The Volvo Car Open is one of only two WTA stand-alone tournaments held in the United States (the other is the Mubadala Silicon Valley Classic in San Jose, Calif., in July), and the only one contested on clay. For the players, this week has been an opportunity to prepare for the European spring clay season that begins later this month. On Saturday, Keys will face unseeded Monica Puig of Puerto Rico, ranked 63rd, who advanced over No. 11 seed Danielle Collins of the United States, 6-3, 6-2. “It feels great,” said Puig following her quarterfinal victory over the 34th-ranked American. “It’s been a long time coming. I haven’t really had many good results strung together in a long time. It’s been a minute since I’ve had four matches in a row won. So I’m really happy with that. The other semifinal will feature No. 5 seed Carolina Wozniacki of Denmark, ranked 13th, against No. 16 seed Petra Martic of Croatia, ranked 53rd. Wozniacki endured a 16-minute final game to beat No. 15 seed Maria Sakkari of Greece, 6-2, 6-2, that was finally decided on the fifth match point. Meanwhile, Martic took out No. 9 seed Belinda Bencic of Switzerland, 6-3, 6-4. This entry was posted in WTA Tour News and tagged Charleston, Madison Keys, Volvo Car Open, WTA.